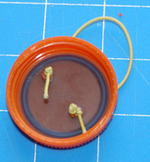 Here is my contribution for this months pincushion challenge, "recycle". 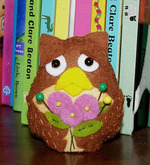 He was a real hoot to make! Okay...I'm sorry, that was bad. The recycle comes in with the flowers. 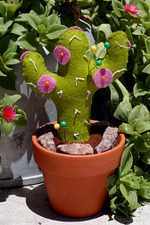 They were originally on my last pincushion when I used them for my flowering cactus. 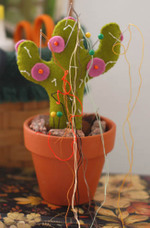 Well, I was working on an assignment and ran out of the orange beads that I was using so I "stole" them off the cactus. Sure, I could have just replaced the beads with another color, but this was more fun. 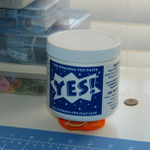 Be sure and check out the other pincushion contributions. SO clever. 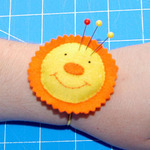 I was so excited when I heard about the "pincushion challenge". What better way to use up some felt scraps lying around! The July theme word was "flower" and I decided to do a cactus flower since we live in the desert. Above is the 'glamour shot' I took of it when I finished it last month. Yikes! I know, it's a mess. 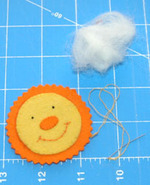 But I have found through these tight deadlines I'm working on now that a major time saver is using multiple needles. You can't imagine how much time I would spend threading and rethreading with one needle. What was I thinking?? I'm still buried under felt , finishing up 2 educational books. Deadline is Aug 7th so I best get back to it if I want to finish in time!